If you have plans of spending the school break or the coming holiday season away from home, you may begin exploring for cheap airfare online. From time to time, local airlines announce domestic and even international seat sales and you should be very quick in reserving a seat or two because the promo ends so fast. If you are reading about free dating sites, you can drop it for a while and reserved as much seat do you want to get. My husband is on the look out for a discounted seat sale for Gensan, and he might be lucky if he can reserve one from this ongoing promo of Cebu Pacific. 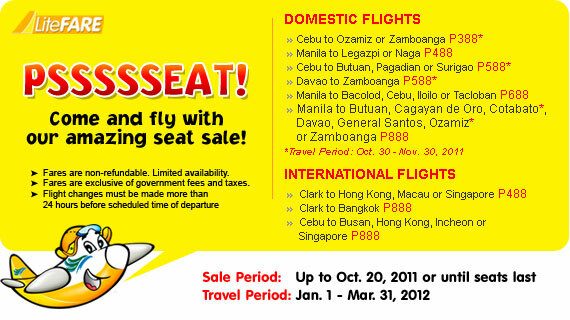 This entry was posted in Travel/Airfare promo and tagged airfare promo, seat sale on October 19, 2011 by Yami.